This was the last outing in 2017 for Peter and myself and our second attempt at this event - our first attempt 2 years ago not troubling the scorers after a very wrong interpretation of the codeboard procedure! 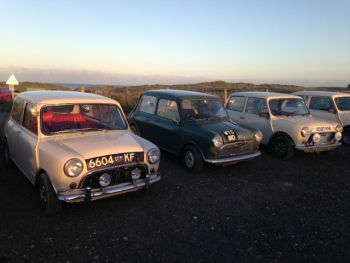 The event is unique in that it is restricted to original Minis and does not allow variants such as the Riley Elf or the modern BMW Mini. It is ably organised by Niall Cook and his team from the Mini Cooper Register, with significant help from Hadrian Motor Club. This year's event utilised its now usual format of a number of tests on the Saturday afternoon, followed by a tea break and then a 90 mile evening road rally before finishing for a late supper. An excellent entry of 20 cars had been attracted, the highest for some years, with probably the current two best navigators in the country in attendance. In Car 1, Graham Cornthwaite and Ali Proctor were going for a 5th consecutive win, in Car 2, Steve Entwhistle and Andy Pullen brought along one of the most famous Mini's in the world - 6EMO - Paddy Hopkirk's own Monte Carlo winning car. We were seeded as Car 9. After morning scrutineering in Cramlington we headed out from MTC1 to the Spine Road and north to Lynemouth for the first two of four tests on the former Alcan smelter site. The first test wasn't good, some indecision dropping us time, but the longer 2nd test was a lot better. From here we headed via a short and muddy farmyard test at Ellingham up to Felton for 2 tests on the former kart circuit at the east side of the airfield. These latter two proved great fun and very quick. It was then back to Alcan via the farmyard for a repeat of the first 3 tests. The first layout at Alcan was a lot better until a lurid spin spoilt things. The 2nd test went better though. With the event running ahead of schedule and the marshals for MTC2 at Cresswell still marshalling at Alcan, we were given the opportunity to do some spectating before heading off to the tea halt. Leaving Alcan there was a strange noise from the rear (the car, not the crew!) and we found we'd picked up a puncture. Hardly surprising given that most of the site is now demolished and there was all manner of debris lying around. During the tea break at the Drift Cafe in Cresswell, results from the tests were posted and we were lying 4th overall, a satisfactory afternoon's work. The evening leg started with a long run up the coast via fuel in Amble to the start of the first competitive just north of Lesbury. All navigation was by plot and bash, with each section in a sealed envelope to be opened on your due minute. The first section went well and the next control came into sight with time to spare but we had only picked up 2 of the 3 codeboards on the section. With a fail, rather than a time penalty for a missed board, we elected to go back and see which board we'd missed. It turned out to be the 2nd but neither of us had seen it so we assumed it had gone missing and headed back to the control, just getting in on our minute. It transpired no-one else had the 2nd board either so that made us feel a bit better. The next few sections went OK, with the odd minute being dropped before a 4 minute section designed as a dropper that used mainly farm tracks and finished with the private road under the A1 at North Charlton, which we'd used earlier in the year on the Berwick Classic in the other direction. The section included 2 PC's and at the first we got stuck behind the car in front who'd beached in the ruts while trying to get away. We then had to follow him to the end of the section resulting in another 2 minutes dropped. With the tests completed, Peter and Guy's car waits in the late afternoon sunshine at Cresswell before the start of the evening leg. The next section was a seemingly straightforward run west over North Charlton Moor to Chillingham, with a code board to be found in a not as map location where a footpath and a bridleway met the road. Unfortunately the NAM diagram looked like a small lay-by just to the right hand side of the road, but in reality it involved driving off the road, round a farm yard to get the board and back onto the road. We couldn't find the board and with a board already missing on the first section, we assumed this one had gone walkabout as well. With hindsight,we should have spent more time looking for it (Ali Proctor drove right back from the end of the section to finally find it, at the cost of 14 minutes) but we didn't and picked up the dreaded fail. There was a dark cloud over the left hand side of the car for the next few sections as we ran around the Ingram Valley and Powburn and then on through Abberwick Ford but at least we were cleaning sections now. Another missing board near Bolton caused some confusion and then the car decided to join in, the floor mounted dip switch falling apart making use of main beam difficult and sporadic. More sections over Alnwick Moor, across the A1 and through Guyzance brought us to the next MTC near Acklington where the newcomers finished their event. With 8 minutes dropped at this point we only had a 2 minute wait from the 10 minute time recovery before restarting on the final timecard. The next section ran down the B road from Acklington to East Thirston and then onto Felton Airfield before running round the yellow that uses the old perimeter road to finish beside the A1 junction. This all had to be driven on dipped beam, including finding our way round the open expanse of the airfield and the gate to get out again (we could have been in there all night!) and we cleaned the section. Very satisfying. With ice now forming to keep us on our toes, the final sections ran around Wingates and Harelaw and on through Mitford and Tranwell Woods before the final control just outside Glororum. There was then a non competitive run to the Snowy Owl by Northumberlandia for a hot buffet supper and results. We were pleased to drop only 2 minutes on the final timecard and when results were posted we were 6th overall with 10 minutes dropped on the evening leg but with the one fail. Hypothetically, if we had gone back to find the board and avoided the fail we might have stayed in 4th place. Steve and Andy took the win after Graham and Ali's time loss on North Charlton Moor. It had been a long day, with the evening leg especially tough - in three and a half hours our longest pause was about 2 minutes, not even time for a pee! Nevertheless we were more than happy with our performance, especially as we don't do a lot of darkness road rallying these days and it capped off a great year for Peter. 5 events have yielded 5 top 10 finishes and 4 class wins.